This morning I awoke for work refusing to open my eyes because the cold in bones told me all there would be to see was frost invading the world outside. As I looked in the mirror, furious dark rings framed the eyes starring back at me, I was determined to be grumpy. I was tired, I looked a mess, and there was ice outside. Peering at my discontent I remembered that I have undertaken a vow of gratitude, so I rethought: I was tired because I got in late, I got in late because I went to an amazing gig, it was icy because it is winter (somethings you simply cannot change). Did I mention the amazing gig? Two days ago I never Australian knew singer/song-writer Matt Corby existed, luckily my Aussie friend did and asked if I wanted to come along to a gig. I replied with the affirmative, my only question being, what type of music was it? Folk. OK, I could get down with that. After a series of disatruous events in the run-up to the show – a peak hour London Underground commute, station fires, lost tickets (on both our parts), and a scarf that came with an aphyxiation hazard – we arrived, shivering and weary, outside the beautiful Hackney Round Chapel. Inside rows of chairs flocked around the pulpit that was a stage. Although I had not expected to be sitting down my feet were grateful and we shamelessly grabbed seats on the second row. Whilst the seating arrangements made for a more introverted audience – we were told as much by the support act Bear’s Den front man who was genuinely hillarious – it also set the mood for an intimate live performance. Bear’s Den came to an end, the set changed, and the main man appeared accompanied only by a guitar to open the set. Having only had one EP’s worth of education on the Matt Corby experience I was still happily nibbling on my chocolate and distractedly trying to point out the set features to my friend. I soon realised that she and the entire audience were transfixed by the man on stage and he was yet to strum a string. It wasn’t until the first note of Big Eyes escaped his mouth that I heard what everyone was waiting for. I stopped crunching my chocolate and simply melted into the music; my eyes closed and my ears hooked. His voice was so melodic and his range contrasted from the gruffness of soul and blues in Soul A’fire, to angelic softness in his signature EP Brother. What was most enjoyable about watching the performance was the clear comradery between the band members, and that each one was distinctive and fascinating to watch; I fell in love with Bree Tranter, the ethereal keyboard player and was utterly mesmerized by drummer Chris Maas.The finale, My False, had us all up on our feet as the band rocked out and literally let their hair down. You could not doubt the passion they felt for their music. My only wish was that there was more. On my way out I couldn’t shake the feeling that there was something more to come, yet my feet continued shuffling me back outside to the cold Hackney streets. I went to the chapel of Matt Corby and came out a believer. Categories: London, Uncategorized | Tags: acoustic, Arts and Entertainment, Australia, Bree Tranter, Chris Maas, England, EP, Extended play, Hackney, Hackney Round Chapel, live music, London, London Underground, Matt Corby, Music, The Black Keys | Permalink. 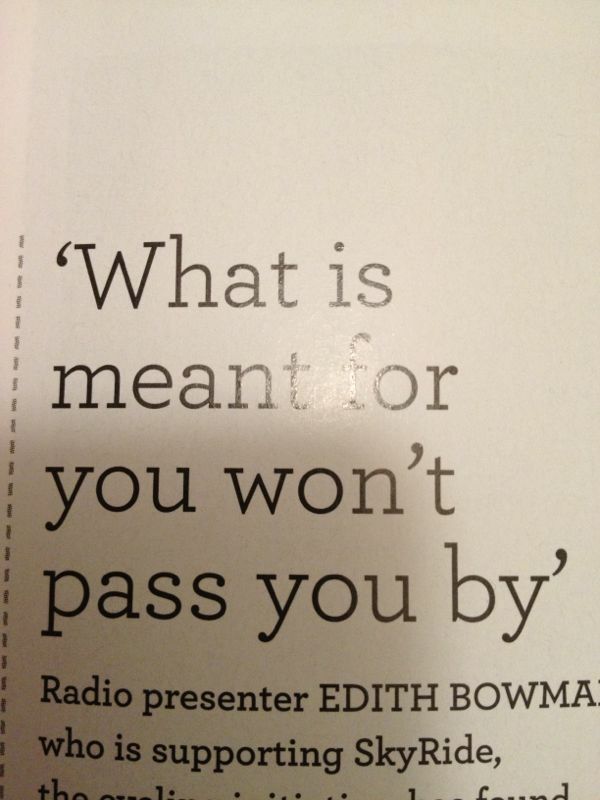 I’ve always been a firm believer in what is meant to be will be, and this thought echoes the same sentiment. This reminds me to stop looking at all those imagined alternative paths in life, the what ifs and feeling like I’ve missed out on opportunitites, because ultimately everything that we decide is right in that exact moment of deciding it, whether we like the outcomes or not there is always some reason to the chaos. Categories: Life, Philosophy, Uncategorized | Tags: Arts and Entertainment, destiny, Edith Bowman, fate, friendship, London, philosophy, Vernacular photography | Permalink.